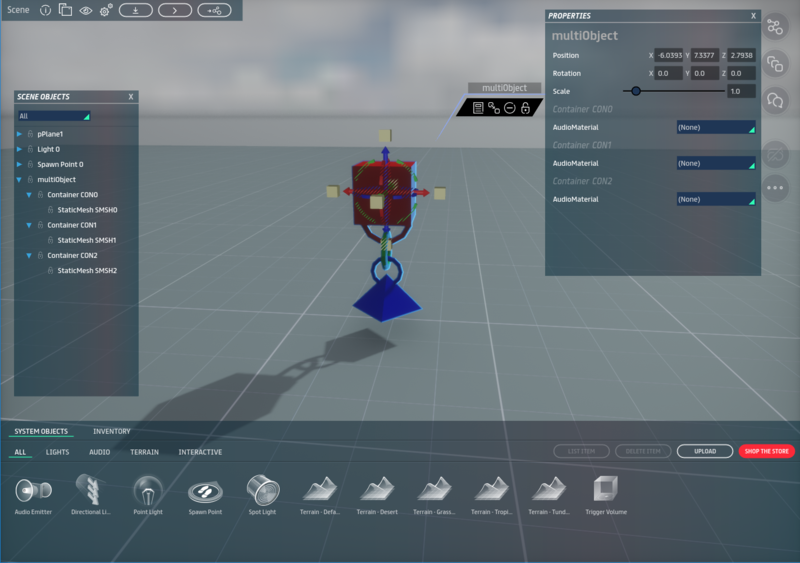 If you have created a 3D model that has multiple (not necessarily connected) parts, it is possible to upload the model to Sansar as a multi-part object. Export your model from your 3D tool as you normally would; just make sure all the relevant parts of your object are selected before exporting. A multi-part object with three parts. Notice Containers CON0, CON1, and CON2 in the Scene Objects panel. These containers represent the three parts of the multi-part object. 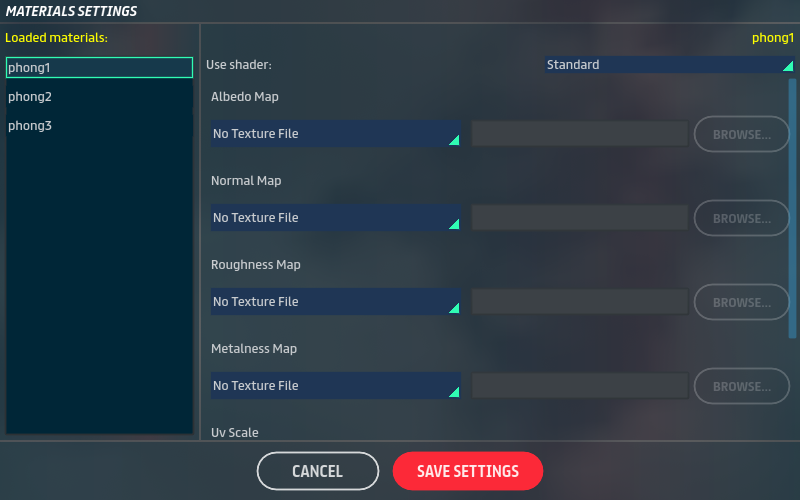 Each part may be assigned different shaders and textures in the Materials Settings window during the upload process. Each part is assigned its own container under the main multi-part object in the Scene Objects panel. This is where you can edit each part's properties after uploading the multi-part object. Each part may be assigned its own audio material. If any of the parts are set to be dynamic, they may be individually affected by forces in the scene. Each part may be individually scaled larger or smaller in edit mode, and may be independently moved without moving the entire object. To select a part, highlight its container component in the Scene Objects panel. Each part may be imported with its own collision mesh, based on a specific naming scheme. Note: The current limit for parts in a multi-part object is 100 parts. When uploading a multi-part object, you can define different shaders and textures for each material you have defined in your 3D modeling tool. Select each material under the Loaded materials list to set its shaders and textures. If you do not define any materials in your modeling tool, a single default material is assigned to all parts of the multi-part object. Each collision mesh name must exactly match an existing mesh name in the .fbx file, with the string "_collision" appended to it. For example, the collision mesh for a mesh named "sphere" would need to be named "sphere_collision". When imported, properly named collision meshes are imported as collision volumes rather than static meshes (visible objects). The .fbx file shown in this image contains six meshes: redCube, greenTorus, bluePyramid, and corresponding collision meshes for each, with "_collision" appended to each name. This .fbx file imports to Sansar as a three-part object (instead of six) with collision meshes for each part.